Before Edison’s electric light bulb was invented, if you wanted to illuminate the darkness you had to carry a naked flame with you. Can you see 'Fire Hazard' written all over that? Fortunately, in 1890 Hubert Conrad invented the battery powered Torch and over the years it has evolved to match the requirements of individual groups of users. The modern torch now provides the user with an array of choices in type of lamp, shape of the beam, construction materials and approvals for hazardous work environments. The aims of this article are to compare differences between various types of technologies used in modern torches, and discuss this vital tool in the context of workplace safety. Professional lighting manufacturers have been striving for years to develop the brightest possible torches. They have struggled to produce lamps that not only create impressive amounts of light but also last for a reasonable period of time. The classical Edison incandescent lamp utilises a metal filament (usually tungsten) through which current is drawn to heat up the metal and generate light. To prevent the filament from oxidising, it is suspended in an environment devoid of oxygen. Usually, this environment is achieved by surrounding the filament with a glass envelope and replacing the air inside with either a vacuum or an inert gas. In recent years it is these inert gases, such as Halogen, Krypton and Xenon that have allowed manufacturers to achieve greater amounts of light output and also allow the filament to burn at higher temperatures. By using these ‘classic’ gases, the results are superior to a simple vacuum lamp as they offer a white, collimated beam of light that provides a better tool for professionals such as plant maintenance, firefighters and law enforcement. In general terms, Halogen and Krypton would be more powerful than Xenon, but this statement is not always accurate. Powerful light output also depends on many other components as well as the design of the torch. The difference in the whiteness, or color temperature, between torches is due to the type and quantity of gas inside the glass bulb of each torch. Every manufacturer uses different quantities of these types of gases and, consequently, outputs vary. High-performance torches typically use Xenon gas inside their lamps, as this element has a higher molecular weight which allows the filament to burn at a higher temperature and, in turn, produce a brighter, whiter light. Incidentally, Xenon is the same gas used by satellite boosters to steer them through space. Another important factor in the making of a professional torch is the lamp reflector. The shape and texture of the reflector has a marked effect upon the quality of the beam that is generated by the lamp. Ideally, an efficient reflector should collect all of the light generated by the lamp to create a beam free from shadows and dark rings. Compare the beam quality of high-end products from premium manufacturers with cheaper lights and you will see a distinct difference! The batteries used to power torches have also evolved over the years, with manufacturers striving to provide the maximum amount of energy inside the smallest container. Torch manufacturers want high voltage and amperage-hour capacity in order to create the brightest and longest lasting torches, and the battery manufacturers have answered the call with new types of powerful primary alkaline and lithium cells, as well as rechargeable nickel metal hydride (NiMH), sealed lead acid (SLA) and nickel cadmium (NiCad) battery packs. With each passing year, the duration of batteries increases while the size of cells shrinks. Probably the most significant advancement in the field of lighting technology has been the Light Emitting Diode (LED) invented by Nick Holonyak in 1962. This single invention has created a revolution throughout the lighting world. The basic advantages of the LED over Edison’s incandescent lamp are greater efficiency of light per watt, lower cost of lamp replacement, longer battery life, and greater impact resistance. The LED produces light by moving electrons through materials to create photons of light. The materials used to create the LED are organised into a "chip" and lie on a flat substrate. In contrast, the classical Edison filament hangs between to poles like a tight rope. By lying on a flat base, the LED is inherently more stable when subjected to an impact, which can literally mean the difference between life and death as we shall see later in the article. The LED also creates very little heat compared to the filament and this aspect alone lends itself to a safer working environment, especially when used in a volatile atmosphere. This lack of heat means that more energy is converted into photons of light, whereas the filament lamp creates a tremendous amount of heat as the filament burns. This can lead to a surface temperature on the glass envelope in excess of 150 °C (302 °F) - enough to automatically ignite some volatile gases. Probably the most important advantage of the low heat an LED produces is that the lamp’s life is upwards of 100,000 hours, compared to the 20 to 60 hours of a conventional torch lamp. As one can imagine, the combination of low battery consumption and long lamp life leads to a torch that rarely needs replacing. The positive effect on the environment due to a reduction in battery consumption is to be applauded, as is the reduction in battery replacement cost. However, the incandescent filament still has one significant advantage over the LED and that is the ability to create tremendous amounts of light simply by increasing its filament size. One disadvantage of the LED has been its poor ability to focus the light emitted from the chip. Until recently, the only way that torch manufacturers could create a product that generated a reasonable amount of light was to package many LEDs together into a cluster. This approach created a soft wide beam that was fine for close up work but was not focused enough to throw light over distance or penetrate smoke or fog. This situation changed in 2003 with the advent of a new technology referred to as RECOIL LED TechnologyTM from Peli Products. For the first time, an LED could produce the brightness of a classic incandescent lamp but with the longer burn time and lower operating costs of an LED. In order to compare professional torches, the user should decide which features are most applicable to his work environment. Torches can be compared by reviewing light output characteristics, battery life, manufacturer’s guarantees, lamp replacement costs, price, and, most importantly for the health and safety market, hazardous location approvals. With respect to the measuring of the light output, manufacturers initially used Candlepower as a measurement. Today most of them use Lumens, and Lux. Lumens indicate the total amount of light emitted by the light source, whereas Lux measures the intensity of the beam at a distance - itself a function of the reflector. Choosing carefully which torch would better fit a user’s expectations means that several manufacturers’ torches should be compared for differences in brightness. Only by doing that will the user be able to decide which torch will match his needs in critical situations - a life could depend on this decision. Some users will be concerned about the consumption of batteries and lamps. Probably the most popular reason for a torch being discarded is a burned-out lamp. With a life upwards of 100,000 hours, the LED torch rarely requires replacement. In addition, the low battery consumption of the LED torch will ensure that financial budgets are not eaten up buying batteries. Finally, the decision to purchase an LED light is kinder on the environment, as fewer batteries mean less waste. Some applications require brightness over all other considerations, and it is here that the incandescent torch reigns. For users requiring highly focused beams, such as fire fighters and scuba divers, torches should be examined for beam characteristics and their ability to penetrate the environment in which they are intended to operate. By their very nature, all torches are portable. However, market segmentation has forced manufacturers to create lights that match their user’s specific requirements, of which portability is an important criterion. 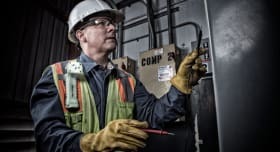 Many industrial users of portable lights are increasingly adapting to the hands-free approach of using headlamps and brackets that mount lights onto work helmets. Available in a wide variety of sizes and styles, headlamps and torch helmet brackets allow the user to focus light on a task while allowing them to use both hands rather than hold a torch. Other users, such as firefighters, like to attach the light to their equipment so that they can release it without fear of dropping the torch on to the ground. Such users look for torches equipped with rings and clips made from durable stainless steel. When designing a new torch, it is important to keep in mind the type of user that it is intended to be used by. A torch designed for law enforcement, for example, may not have much in common with the type of torch needed by a hazardous area worker. For a law enforcement professional, the safety approval certifications of a torch are not crucial. A police officer requires brightness for sudden tactical situations, tough materials for impact-resistance, and may need to mount the torch to a gun. For a hazardous area worker, on the other hand, safety certifications are critical; a handy and lightweight torch, one that is extremely powerful and features a long burn-time or an extremely powerful lantern for the toughest tasks will be desired. Depending on different users’ requirements, lighting systems can vary quite a bit. When a torch needs to operate long hours, it is more efficient, in terms of cost, to use a rechargeable system rather than one with an alkaline primary battery. Workers operating in atmospheres with high temperatures should select plastic rather than metal torches, in order to avoid excessive heating of the torch body. Finally, workers within hazardous locations need to make sure that their torches are safe and correctly certified by the ATEX Directive (in Europe). Is your torch correctly certified? Before going into a hazardous area, you need to ask yourself that question. Your life could depend on it. This may seem dramatic but the truth is that a torch could be a very harmful tool if it is not used correctly or used in the wrong place. By that, we mean that the worker needs to be very aware of the type of area in which he or she is planning to work and of the type of torch that can (and cannot) be used there. Why are torches required to conform to safety standards? Though they seem to be small and innocuous, the lamp and the batteries inside can be a significant source of ignition when used in a hazardous and volatile environment. The lamp filament operates at a very high temperature and some gases will ignite if they come in contact with either the filament or even the glass envelope. The batteries themselves can be a source of ignition, especially if a short circuit occurs resulting in the generation of a spark. Even the body of a plastic flashlight can build up a significant static-electric charge, and some manufacturers plate their lights with special materials to prevent such build-ups Such lights are typically referred to as "Zone 1/Zone 0" torches. In order to prevent accidents, lighting systems need to be approved to certain safety standards. There are many of them, including Underwriters Laboratory (UL), Factory Mutual (FM), Canadian Standards (CSA), Urban Search and Rescue (USAR), Mine Safety Health Administration (MSHA), and the Australian Board of Approvals (AUS). In Europe, torches for use in hazardous areas need to be certified to ATEX Safety Standards. Notified bodies certify torches to ensure that they pose no threat of ignition when operating in hazardous locations. By using only approved laboratories, torches are tested to ensure that they will withstand rigorous impact and drop tests, severe environmental exposure, and meet a minimum of IP54 ingress protection. The notified bodies test the torches by subjecting them to worst-case scenarios. For example, the spark generated by a short circuit of the batteries is used to determine if it will ignite a chamber of gases where the torch is expected to operate. Only if the gases fail to ignite will the light be certified for operation within that environment. The ATEX Directives (European Standards) became mandatory on the 1st July 2003. They regulate the lighting systems developed by manufacturers and the safety and health protection of workers. It is imperative that a torch used by a professional such as a firefighter or plant maintenance technician operates reliably in the field. The ramification of a torch lamp failing at the critical moment when a firefighter enters a burning building needs no explanation. LED technology renders lamp filament failure, which is probably the most common mode of torch lamp failure, a thing of the past. In addition, the careful measurement of filament and LED temperature ensures that the user knows precisely in which hazardous environments the torch is safe for operation. The combination of modern LED technology and the design standards necessary to pass hazardous location ATEX certification result in an impressively high degree of reliability. 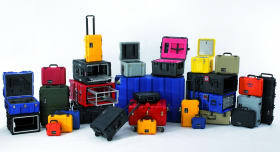 With ATEX, electrical equipment is classified by categories. This means that every category corresponds to an area, and each area is classified according to the length of time the flammable material can be present there, as indicated in the table above. How can I recognise if a torch is correctly certified by ATEX? Nowadays one can find many cheap lights on the market, but after the low price has been forgotten the true degree of quality will surface. As a manufacturer of professional torches, we recommend users to check the quality of a lighting system before buying it. By quality we mean, in general terms, brightness, tough materials, safety certifications, and features important to the application in which the torch will be used. It is also important to consider the guarantee that the manufacturer offers. The length of that will determine if the torch will stand the test of time and extreme conditions. Professional, high-performance torches are significantly more expensive than regular incandescent ones. Purchasing agents and individual buyers may not see the rationale in purchasing such expensive lights but over a period of time, the high initial cost of a professional, ATEX approved torch will typically be less than a cheap one. Failure of the lamp is typically the reason that most torches are discarded. High performance Xenon-filled lamps must withstand significant internal pressure from the gas, which translates into longer lamp life. As mentioned earlier, the inherent long life of LEDs renders lamp replacement redundant and their low battery consumption rate adds to the savings.